Enjoy a lighthearted week of dancing with opportunities to walk in the beautiful Quantock Hills each afternoon! We’re delighted to welcome caller – and keen walker – Rhodri Davies to the team this year, joining regular band Stradivarious (Rod & Frances Stradling, Poppy Weatherall) and our walk leaders Nan Ward & Roger Phipp. A mixed-programme of country dance workshops will take place each morning with Rhodri and the band. You’ll have a chance to brush-up your dancing skills and maybe learn a new dance or two, before heading off into the hills – quite literally – to enjoy the spectacular landscapes of this distinctive and nationally important protected area. Guided walks will be led by our knowledgeable and enthusiastic local guides Nan Ward and Roger Phipps, giving you a chance to learn more about the history and wildlife of the hills, or simply to enjoy an amble with in beautiful countryside in amiable company! Then it’s back to the Manor, for dinner, and dances every evening. Feel free to bring along instruments for the odd informal session in the bar! This course aims to be suitable for everyone with a reasonable level of fitness. The morning dance workshops will be friendly and encouraging, enabling novice dancers to gain confidence and more expert dancers to refine their skills and try new dances. The will be a choice of two walks each afternoon, tailored to meet the requirements and abilities of the group. One will be a shorter ‘stroll’ option, and the other a longer and more challenging route; the opportunities for walking on the Quantocks are endless. 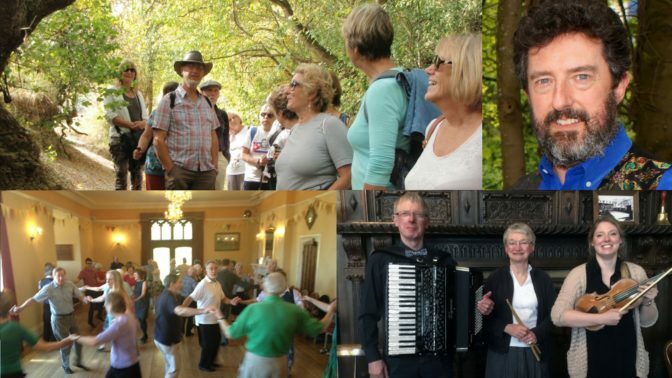 Please note we are not offering full-day walking options; this is primarily a dance week, with opportunities to enjoy afternoon walking in a friendly and social group. A reasonable fitness level is required – even short walks may include steep climbs – and appropriate clothing and footwear suitable for a variety of weather conditions is essential. Car sharing will be necessary for some of the walks. Rod & Frances Stradling are experienced in playing for many kinds of traditional dancing, and regular favourites at Halsway Manor! They play in the band Stradivarious together with Poppy Weatherall, who will be bringing her own wonderful fiddle playing to the weekend. Rhodri Davies is well known as a regular caller on the UK Folk Festival scene. While he particularly specialises in contras, he covers a wide variety of styles and these will be in evidence over the week. Based in Stockport, he started dancing at Manchester University through both the folk dance society and the hiking club ceilidhs. It used to be joked that 10% losses were acceptable on any one club hike; Rhod will be aiming for a much better success rate when teaching the dances! Nan Ward and Roger Phipps are regular walk leader for Halsway Manor. They are keen walkers and have lived for many years in a small hamlet on the Quantocks; they invite you to join them and share their love of the Quantocks. The Quantock Hills were the UK’s first AONB, receiving its protected status in 1956; its distinctive character, natural beauty and cultural heritage are so outstanding that it is in the nation’s interest to safeguard them. Explore and you will find rocky Jurassic coastline, exposed heathland summits, deep wooded combes, undulating farmland and attractive villages. A haven for wildlife, the Quantocks offer many rare habitats for flora and fauna, and are home to an important population of red deer. Evidence abounds of early settlements; Bronze Age barrows, ancient stones and ridgeways, Iron age hill forts and earthworks. Inspired by this wild hilly ridge, the young rebel poets Samuel Taylor Coleridge and William Wordsworth roamed, writing as they walked, forming the Lyrical Ballads and their notion of English Romanticism.